For a graduating senior at Biola, the walk across Metzger stage to receive one’s diploma can be a blur. It’s a journey packed with meaning, yet it’s over in just a few seconds. When Dianey Burgos walked across that stage on May 26, however, it was the culmination of a much longer journey. For Burgos — the first member of her family to graduate from college — it was the end of a journey that began in East L.A., on a street bordered by gangs on one side and drugs on the other. Dianey (pronounced DNA) grew up only 14 miles from Biola’s La Mirada campus, but in many ways it was about as far from Biola as you can get. Few people in Dianey’s neighborhood make it to a commencement stage of a private university. Dianey’s mother and father — first generation immigrants from Mexico — made it as far as junior high (mom) and second grade (dad). “Ever since I can remember, my mom told me, ‘Go to school, get educated so you can have a career, so you can be better than this,’” said Dianey, who caught a break in high school when she transferred out of Roosevelt High to Bravo Medical Magnet High School, where everything is oriented toward the goal of going to college. Dianey had no idea what Biola was before hearing about it from friends and people at her church, who urged her to apply. She visited campus on University Day and wasn’t hugely impressed, but something pressed her to apply anyway. 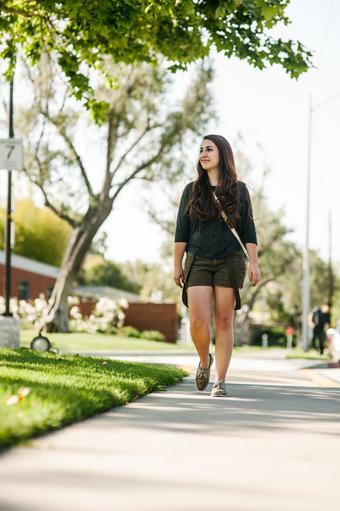 “I know it was God leading me here,” said Dianey, who found out only after she’d been accepted that several friends had been praying for her to choose Biola. Soon Dianey’s mind was made up: She was coming to Biola. Her parents took more convincing. Even with scholarships and financial aid, sending their daughter to a private university on a janitor’s income was hard to envision. The only way it could work was if Dianey didn’t stay in the dorms on campus but instead commuted to campus via public transportation. It was a sacrifice Dianey was willing to make. At 5 a.m. each morning, five days a week for her entire freshman year, Dianey’s dad dropped her off at Union Station in downtown L.A. on his way to work. From there, Dianey — 17 years old, alone, without a cell phone — took three separate trains to Norwalk, and then a bus to Rosecrans and Biola avenues, from where she would swiftly walk to campus in order to make her 8 a.m. classes. L.A. traffic and public transportation being what it is, she was almost always late. Her professors never knew why. Few of her friends did either. Dianey was quiet about her commuting situation. At night, Dianey repeated the arduous buses-and-trains journey, though it took even longer than in the morning. If her last class ended at 4:30 p.m., it would be around 8 p.m. sometimes before Dianey got home, leaving her only a couple of hours to do homework and sleep before it was time to repeat the relentless cycle. She used the time on the buses and trains to do homework, read her Bible and chat with those around her. Numerous conversations were sparked when people noticed Dianey’s reading material, and she was able to share the gospel with some. She also did a lot of praying. As a young girl, frequently surrounded by strange men coming home from work, constant prayer was a lifesaver. There were moments when the commute felt like an unfair burden. One afternoon at the end of her first semester, Dianey remembers standing at the bus station on Rosecrans, waiting for a bus that was very late. The commute was a struggle, but for Dianey, Biola was worth it. She pressed on and made the rigorous commute each day during her freshman year, rising every morning earlier than when many Biola students go to bed. Though she was able to live in the dorms starting sophomore year, Dianey faced other challenges as a student at Biola. As a commuter and minority on a mostly white campus, it was sometimes hard to relate to the typical Biolan. Having gone to a Spanish-speaking church her whole life, Dianey had to learn Bible stories in English for the first time at Biola. She had to learn how to pray in English. She was unfamiliar with the term “missions trip,” and didn’t quite get the typical Biola humor. And then there were the financial struggles. Dianey couldn’t afford a meal plan her freshman year; she relied on friends to swipe her into the Caf or bring her extra food. Her dad collected cans and recyclables so Dianey could afford all the books she needed. Her aunt gave her a laptop sophomore year, the same year she got her first cell phone. Finding loans and paying tuition was a semester-to-semester struggle, but God was faithful and Dianey made it through Biola with a debt-load less than what it could have been. Her junior year as a resident assistant, Dianey had an income and was able to help her parents out a bit. Senior year she resolved to not take any loans out at all. Her aunt surprised her by covering the tuition balance for fall semester, and then — to Dianey’s complete surprise — her own parents told her they had saved up money so that they could pay in full for her last semester of college. As her parents told her they wanted to pay for her last semester, tears streamed down Dianey’s face. For her parents, Griselda and Filemon Burgos, Dianey’s education took a lot of sacrifice, but it was worth it. May 26, 2012, was the first day Dianey’s parents spent time on Biola’s campus, aside from dropping her off at the dorms. They were intimidated on campus. It was difficult to relate to the world of Biola, but they were there to cheer on her daughter as she graduated. Dianey’s graduation was a success as much for them as for her. She’d come a long way since that morning four years prior when her dad dropped her off at Union Station for her first day of college. In four years, Dianey had gone from being a commuter who kept to herself to a widely known and respected leader on campus. She’d developed a tight-knit community through B.E.A.T. (Biola’s Ethnic Advancement Team) and had grown a lot through her experiences as an R.A. in Sigma, a mentor to others and a worship leader. But there is work still to be done. Graduating as a sociology major, Dianey leaves Biola to return to her community in East L.A. to pursue a career in social work. Her education at Biola didn’t make her ashamed of “the hood” she calls home; it equipped her to return as a beacon of light. It’s takes a pretty fearless person to take six train and four bus rides every day, alone, to get to college. 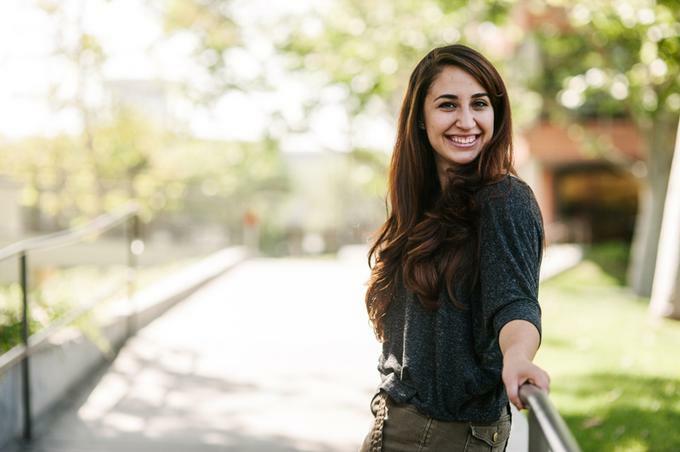 For Dianey, overcoming fear is one of the big lessons she takes away from her time at Biola; she learned the value of vulnerability and putting her needs out there, allowing herself to be known and grown by others. It’s a concept she takes with her back to East L.A. It takes courage to change one’s position in life, but it’s possible. Dianey knows this better than most, and so do her parents. As they watched their daughter receive her diploma from President Barry H. Corey, they saw the fruits of their sacrifice but also the tangibility of grace and blessings given by the God of hope. For many years Dianey’s parents have worked to bring peace and the love of Christ to their street in East L.A. Her father ministers to the men — the gangbangers, the drug dealers, anyone; her mother ministers to the women. Kira Williams contributed to the reporting of this feature. Photos by Mike Villa. Awesome journey of a wonderful lady that I've come to know. God's richest blessings to her in her endeavors after Biola, as she continues to depend on Him and operate in His Spirit in her community. Great story. Reminds me of my own. Our sacrifices are never in vain. All for the glory of God. I had the honor to be a Church Youth Leader of "DNA". It doesn't surprised me this epic story, because I've know this beautiful lady. I know her commitment and her heart devoted to God. I know that this is a simple example that she is unstoppable, because I know her faith and passion for what she does. She is an amazing worship leader, unbelievable singer, but the best is that she is a truly servant of God. Reading this made my day because this another successful story of people I had the honor to know. Everything is just the anticipation of what God has for your Life "D"; Keep on going pretty Lady, greetings for you and your Family. Dianey story reminds me how I struggled in numerous ways to achieve my undergraduate degree in Pastoral Ministries. I commuted almost everyday from North of Atlanta to South of Atlanta waking up at 5 a.m and dropped off at park& ride, taking first bus and travel 35 minutes in Atlanta's traffic, lay over of 10 minutes and traveling in train for another 30 minutes and 15 minutes layover at Atlanta's international airport, catching another bus and travelled for 40 minutes and then walk 15 minutes in order to catch my first class. I also travelled without cell phone and many times hungry but God always provided for me lunches and coffee. just reminded me of my own commuting on the bus to Biola, after my freshman year, i had a summer job at the library and did not have a car. i was working to save for the upcoming fall semester abroad, Germany. my parents lived in south gate, so i decided to take the bus. each morning i would leave my house early ,take a bus on atlantic ave, get off at rosecrans bl and wait for that bus and get off at biola ave. although, i only did this for the summer looking back, i remember praying for my safety and would be glad to make it home each day. now, i work as a social worker and work directly with the spanish speaking community. i will continue to be greatful to my family since i was the first in my family to go to college and the sacrificies my parents and siblings made to help me pay for my first two years at biola. I have known Dianey Burgos and her beautiful family for the past two years and seen her sing at the Revivals in the city of Llano, California. We have share prayer meetings at her house and I can tell you the piece you wrote about her is all true. I thank you so much for an accurate and meaningful story of Dianey's life. We the community celebrate her accomplishment, her hard work and her love for Jesuschrist. God Bless You All. You can see Dianey Burgos live perform at YouTube: jeshua4ever http://youtu.be/3DsgXuTHmjA. Enjoy.